An expert on cockpit distractions says a low-speed warning system should be explored in the wake of an upstate New York airplane crash that killed 50 people in February. NASA scientist Robert Dismukes told the National Transportation Safety Board on Thursday that the cockpit transcript of Continental Connection Flight 3407 shows the captain and first officer failed to notice the twin-engine turboprop plane had slowed to a dangerously low speed. Dismukes says some aircraft already have audible systems to warn when the aircraft slows too much. 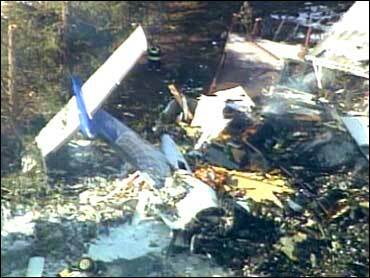 The safety board recommended in 2003, in response to an air crash that killed Sen. Paul Wellstone, that the Federal Aviation Administration explore whether such systems should be required. The recommendation came as the National Transportation Safety Board heard from federal regulators about how to prevent accidents like the February crash of a commuter airliner in upstate New York that killed 50. Colgan Air of Manassas, Virginia, operated the Newark-Buffalo flight for Continental. The accident was the worst U.S. air crash in more than seven years. Today is the last day of an unusual three-day hearing on safety issues that have arisen in the investigation into the crash of Continental Connection Flight 3407. On Wednesday, the hearings focused on whether Capt. Marvin Renslow and co-pilot Rebecca Shaw may have suffered from fatigue during the accident. Testimony in the three-day hearing, which began Tuesday, indicates Shaw and Renslow made several fundamental mistakes as Continental Connection Flight 3407 approached Buffalo Niagara International Airport in wintry weather the night of Feb. 12. Both Renslow and Shaw commuted to work at Newark Liberty International airport - Renslow from his home near Tampa, Fla., Shaw from. Shaw had just flown cross-country to Newark the night before the accident. Shaw also complained about congestion and may have been suffering from a cold. Shaw was paid a salary so low that she was forced to live with her parents near Seattle and commute cross-country, a combination of long travel and little money that a safety official called a "recipe for an accident." The second day of a three-day National Transportation Safety Board hearing Wednesday focused on whether Captain Marvin Renslow and co-pilot Rebecca Shaw were fatigued on the wintry night of Feb. 12 when they apparently made a series of critical errors as Continental Connection Flight 3407 approached Buffalo Niagara International Airport. The Bombardier Dash 8-Q400, a twin-engine turboprop, experienced an aerodynamic stall, rolling back and forth before plunging into a house below. All 49 people aboard and one on the ground were killed in the worst U.S. air crash in seven years. Board member Kitty Higgins said fatigue has been a factor in other crashes and is a major concern for the NTSB and the Federal Aviation Administration. "When you put together the commuting patterns, the pay levels, the fact that the crew rooms aren't supposed to be used (for sleeping) but are being used - I think it's a recipe for an accident, and that's what we have here," Higgins said. Shaw, 24, had worked for Colgan, which operated the flight for Continental, for 13 months, flying 774 hours in her first year. Colgan pays its beginning first officers $21 an hour, which means she would have earned $16,254 that year, although she could have earned more if she worked more hours, said Roger Cox, an NTSB aviation safety expert. In questioning Colgan officials, Cox suggested that Shaw was commuting from her home near Seattle because she couldn't afford to live in the New York metropolitan area on her salary. She had a second job in a coffee shop when first hired. Colgan spokesman Joe Williams initially declined to disclose Shaw's salary, but he said the airline's starting first officers typically earn around $24,000. Late Wednesday he said Shaw's salary was $23,900. The night before the accident, Shaw flew overnight as a passenger from Seattle, changing planes in Memphis, to report to work at Newark Liberty International Airport in New Jersey. She also complained about congestion and may have been suffering from a cold. Renslow, 47, commuted to Newark from his home near Tampa, Fla. It is unclear where Renslow, who was in the middle of a two-day assignment, slept the night before the trip, but he logged into a computer from Colgan's crew room in Newark at 3 a.m. on the day of the flight, according to NTSB documents. Colgan officials testified that their captains typically earn around $55,000 a year, but Williams later told reporters the average was about $67,000. Neither pilot had a "crash pad" or apartment they shared with other pilots in the New York area, nor did they rent a hotel room, NTSB documents said. NTSB investigators said 93 of the 137 Colgan pilots who worked out of Newark at the time of the accident were commuting from far away. The company's crew room at the airport is equipped with couches and a big screen TV. Board members said Shaw frequently slept overnight in the crew room in violation of company policy, joking with other crew members that the room had a couch with her name on it. Mary Finnegan, Colgan's vice president of administration, said the company permits pilots to live anywhere in the country they wish. She said the company also allows them to remove themselves from flight duty if they are fatigued. "It is their responsibility to commute in and be fit for duty," Finnegan said. Colgan officials said overnight sleeping wasn't allowed in the crew room because it was a busy place, making quality rest time difficult. The room's lights were kept on all night. Daniel Morgan, Colgan's vice president for flight safety, said the airline industry has a long history of flight crews commuting long distances to report for work. Morgan said it is appropriate that the airline sometimes schedule pilots to be on duty up to 16 hours at a stretch with a maximum of eight hours of flight time. "It's not an ideal way to work, but neither is working overnight in the post office," Morgan said. Paul Rice, vice president of the Air Line Pilots Association, said airlines - especially regional airlines, where salaries for less senior pilots are lower - have "defaulted to a position that pilots will commute." "People can't go live in these major cities, or even in the suburbs of these major cities, at $16,000 to $17,000 a year," Rice said. A cockpit voice recorder transcript shows Renslow and Shaw engaging in chitchat about careers and her lack of experience flying in icy conditions during the plane's final minutes, even after they had noticed a buildup of ice on the windshield and wings. Colgan officials acknowledged in response to board members' questions Tuesday that Renslow and Shaw weren't paying close attention to the plane's instruments and were surprised by a stall warning. Nor did they follow the airline's procedures for responding to a stall. Renslow grew up in Shenandoah, Iowa.